Gateway, Rzym, Włochy : Rezerwuj teraz! Gateway has a 2pm to 22pm hours reception to provide information tips and maps of the city. Every morning we provide (bread, biscuits, milk, cereals, coffee, juice, jam, butter), for 2.50 euros per person per day. During your stay you will be allowed to use the common kitchen and its appliances (fridge, stove, microwave, pots, pans, cutlery and plates). 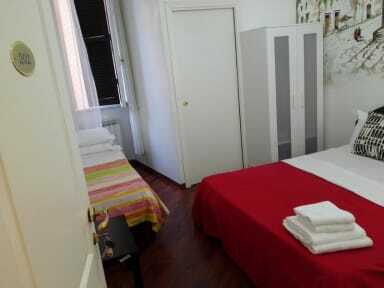 We are at about 15 minutes’ walk down the street to the Colosseum and 2 minutes from Manzoni subway. Within 10 minutes’ walk away there are two of the city's largest and most important churches: St. John Lateran, the Cathedral of Rome, and Saint. Mary Major. We are also a few minutes away from the largest ancient aqueducts, museums, and other cultural sites. The oldest and well known gelato shop Fassi is just around the corner! Room includes: clothes rack, writing table, WiFi and a kettle. Check out from 06:00 to 10:00. I recommend - of you want visit Roma, not spending much money for bed (It's really nice and really nice owner, who is very helpful).